Lisa Leathers and Rori Comstock at the Achieving Accreditation Conference in Tampa, Florida. 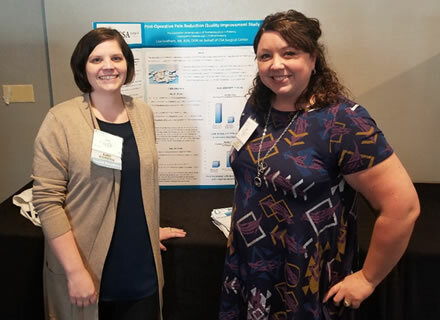 Last fall, I was asked to speak to a group of Nurse Leaders from around the country at a Nuehealth Nursing Leader's Conference about our facilities' Process Improvement program. Process Improvement just means recognizing areas for improvement in patient outcomes and experience and then implementing a plan of action toward the goal we would like to achieve. I happen to love process improvement because I see it as the pathway for our team to work together to push performance and improve the care we deliver to our patients. We have developed a strong program at our surgery center and recognize our entire team's commitment to never be satisfied for the ultimate goal of delivering excellence to our patients. I was very excited to share some of our successes and failures with a group of like-minded Nurse Leaders at the conference and was especially eager to share the results of our Post-Operative Pain Reduction (Tylenol) Study! Little did I know our next conference speaker from the AAAHC Accreditation Organization was sitting in the crowd while I talked through our program. She later encouraged me to submit our Tylenol Study to be considered for the annual Bernie." I was immediately interested in the prospect of sharing such a great opportunity to improve patient care inside an organization with some 7,000 accredited facilities all around the country. We submitted our study a couple weeks later after receiving additional support from our NueHealth leadership team. "YES, no matter what happens this study has a chance to be seen on a national stage and improve patient outcomes for real people beyond our facility." It was a huge moment for us to know that our small but mighty surgery center's efforts could have the potential to make a big difference for patient's where it really matters. 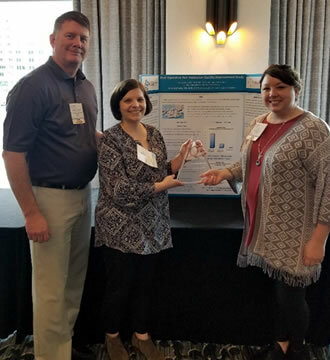 Rob Sorenson, Nuehealth Clinical Director, Lisa Leathers and Rori Comstock, displaying the Bernard A. Kernscher Innovations in Quality Improvement Award. From there we had to prepare to present our poster to our peers at the Achieving Accreditation Conference in Tampa, Florida. During the conference in March, I had the opportunity to network and present the details of our study with something like 350 leaders from across the country. Again, I think the most impactful part of this experience was talking with so many leaders who are looking forward to taking this information back to their own facility. Winning the Bernie – We were honestly so excited to be named as finalists and get to share our study, I'm still not sure we've worked through the shock of actually winning! I do know two things for sure. This award is a reflection of the culture created by our physicians to always put patients first and when everyone on the team is working toward a common goal absolutely anything can be achieved!